GREAT WRITER EXPLODES WITH MAD SURVIVAL FRUSTRATION TOWARD A NATION THAT HAS BEEN LULLED TO SLEEP!!! SKIN IN THE GAME? NOW, WHAT THE HELL DOES THAT REALLY MEAN? MY SPIN IS: YOUR LOVE AND BONDING FOR YOUR OWN COUNTRY MOSTLY DEPENDS ON HOW MUCH OF A STRUGGLE YOU HAVE PUT INTO IT. Don’t blame the citizens for falling prey to all of the negative extreme liberal propaganda insanity being spewed out 24-7 by shallow minded people that think they know best. But, the raw cold steel fact is the welfare state and the 1938 socialist minimum wage law have turned the USA into partly a nation of shallow minded do for me hateful ingrates. How in the hell can the federal government have World War II like staying power when it is burden down clothing, housing, and feeding half the nation? Most of the whole nation is living in fantasyland by putting unwavering faith in a federal government like it is impossible for it to totally collapse. In term of raw survive you trust nothing unconditionally, where is our small farmers and home gardeners to provide some bartering capacity to buy time with when the economy totally collapses. Oh, you silly fool throwback writer, we can get help from other nations, it’s not possible for the gloomy and scare tactics you write about to ever occur. My survival instinct is so strong that I trust nothing without a fallback or backup when it comes to raw survival, period. The only thing that has withstood untold disasters and proven itself down through the ages by keeping the human race alive is the strong nuclear and extended family foundation time and time again, which the USA nuclear family system is in almost total ruins. The federal government by allowing this dependency to happen destroys the strong nuclear and extended family foundation, which takes away a survival need for the nuclear family foundation. Anything in nature that loses its survival need slowly starts ceasing to exist. And the 1938 socialist minimum wage law has turned the once strong powerful societal disciplining USA free market place economy into a phony weak p…. economy that can barely burst a grape in terms of defending and protecting the once strong USA culture and nuclear family system. The great depression itself was only a strong natural purging process, which was a normal but unusual correction process. A free market place economy purges to get rid of negative anti-survival waste and make room for the new, just like the life and death cycle, the problem occurs when the rich and power fights tooth and nail against it to protect their wealth. A simple fact is a nation with a strong nuclear and extended family foundation can survive a great depression, but a nation without one is probably doomed all the way back to the Stone Age. I beg your forgiveness, I never intended to loose it by ranting and raving, it seems as if my pen just took over my mind, sorry folks. Sure, I can be silenced, but that won't prove me wrong, I'm driven, why I don't know, all I know is I must keep yelling the stress call alarm for this great nations survival. Personally, I believe it is shallow minded, dumb, stupid, cruel, and insensitive for the federal government to let half the nation become dependent on it for their sole survival. Every government is going to fail or go broke sooner or later, period. Only, the strong nuclear and extended family foundation along with a strong culture have been proven with the test of time to withstand untold disasters, total economic collapses, or whatever, still with the nuclear family foundation holding in place for new regrouping and rebirth to spring forth. A free nations federal government has no business in the nanny and care-taking business unless as a last resort under emergency conditions if it expects to defend itself during wartime. During wartime a nation may be able to choose guns over butter, but never guns over little starving hungry mouths to be fed. 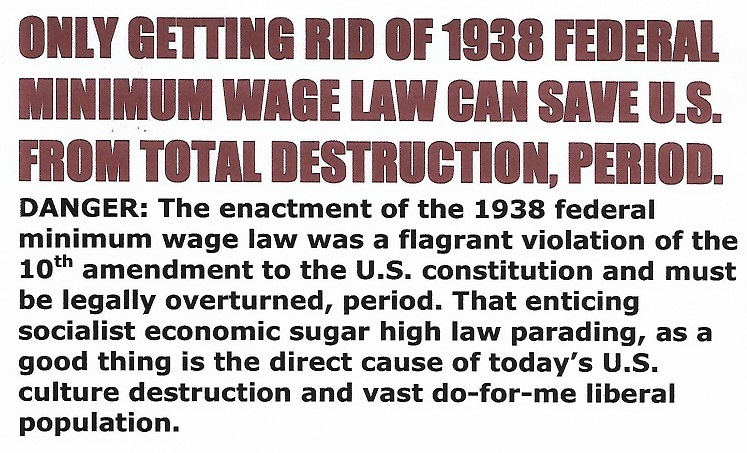 The first step to rebuilding the USA strong nuclear and extended family foundation with a strong culture is to repeal the insane arch-evil 1938 socialist minimum wage law, and then the healing process will begin without major disruptions. FREDDIE LEE SIRMANS LOG: 19 MARCH 2018, 1529 HOURS.